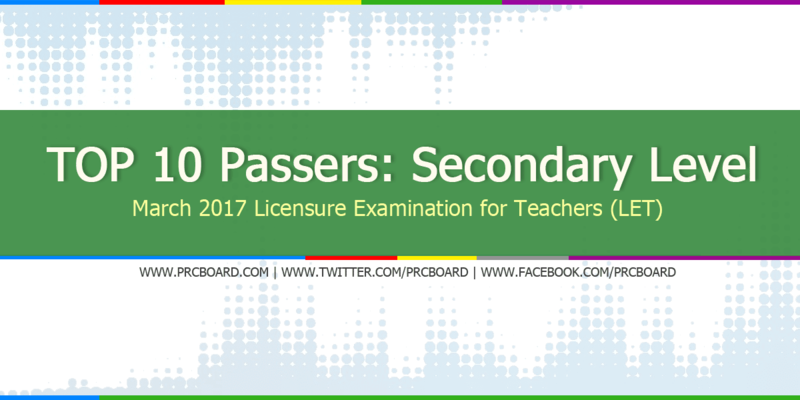 The results of March 2017 Licensure Exam for Teachers (LET) board exam, conducted by PRC’s Board of Professional Teachers are released 40 working days after the last day of board examination. Aside from the official list of passers, top 10 examinees, top performing schools and performance of schools are also posted. Marian Kaye Fortinez Gallego from University of Mindanao - Davao City ranked first in the exams garnering 92.80% rating followed by Acejan Lascuña Jadie from De La Salle University Dasmariñas having 92.60%. Below is the complete list of LET - Secondary Level top examinees courtesy of PRC. While most examinees are asking about the possible release date, as mentioned in the main page of this article, it will be out on May 19, 2017 (Friday). TO ALL re-takers wish you all to pass the Teachers Board Exam. When the result pala Sir and Maam? To God be the Glory. If it is your will, Let it be. GALING TALAGA NG UNIVERSITY OF MINDANAO! SANA JAN NLANG AKO NAG-ARAL! OO NGA. GAGALING NG MGA STUDENTS DIYAN. mag-antay ka. darating din yan!!!! TOP 2 AND TOP 7 -ATENEO DE DAVAO UNIVERITY! wala pa din bang result? I'll let you do the rest Lord for I know you have your plans for me. Whatever you give to me I'll accept it and follow what you want me to be. may result na ba? kailan? waiting po....so excited!! !may halong ka ba lang kunti...hehehe..
May God will BLESS HIS FUTURE MISSIONARIES!!! Yes! Thank you Lord. I have passed the exam.